Something a bit different now. It's interesting because music doesn't always have to be stuff you can dance to, stuff you can sing along to, or indeed have any real intent for anything other than being a piece of music. In essence: music as music. As such, I would like to introduce a split between two acts whose distance from each other has not stopped their very pretty collaboration; Table Music Meeting, a band from Japan, and Rainbow Valley, a singular music-maker from Southend-on-Sea (UK), have teamed up to create the wonderful Autumn Songs. 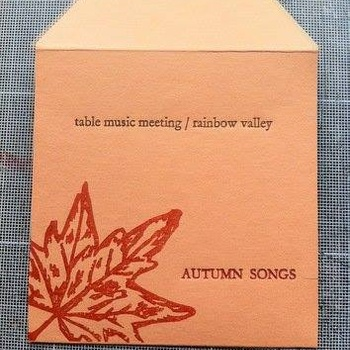 Instigated by Rainbow Valley (aka Graham Boosey and owner of microlabel, Wrieuw Recordings) when he stumbled upon the music of Table Music Meeting by chance on Lastfm, the two entities agreed to each write and record a song about autumn. It's a magical time of year; despite the cold and windy weather, autumn is special for the obvious transition between warm and cold, growth and hibernation, especially in the changing leaves. So anyway, both of em did it and here we are: Autumn Songs is here. Table Music Meeting's 'Autumn' comes first, a blustery, breezy affair that perfectly captures the atmosphere of the season. Using an assortment of instruments — clarinet, recorder, something brassy, xylophone — sounding a little like a glorious toy orchestra, the group create a jaunty melody which contains within it a certain stubbornness to accept the onset of colder weather, as well as the feeling of that slow walks people take when admiring the season's new brown, red and yellow scenery. Dissonant chords play lightly on a piano, summoning the sharp sense of losing summer's warmth, with an overall sound that directly embeds in my head images of people wrapped up warm in cafés, looking out into an increasingly desolate natural world. The contribution from Rainbow Valley, however, is quite different. 'Spinney' (a word that means "a small area of trees and bushes", less dense than a thicket, not as tree-heavy as a copse) is for the most part an ambient field recording of some birds - particularly, I think, song thrushes - chirping away: a very autumnal sound, the sound of early evening and swift sunsets. A slow, simple electric piano melody fades in, plaintive in the midst of nature's continuation, a flow of human understanding and feelings. Soon, a glockenspiel melody floats above, alongside an old guitar playing a slow arpeggio. The sounds of rustling leaves rise up from the background recording as the original electric piano notes grow glitchy before being cut completely out of earshot. A more delicate approach, one closer to nature perhaps, than TMM's offering. However, both summon feelings and images associated with Autumn, though in different ways, which could reflect the potentially differing ways in which autumn as a season is viewed in Japan and the UK, respectively. Instrumental music like this, stuff that has pretty much nothing to do with current trends in the modern/popular music world, continues the tradition of classical music's supposed or maybe inherent ability to paint a picture based on a theme (whether it's antiquity or nature or whatever), but also has a touch of folk sensibility to it, utilising the organic feel and sound of mostly non-electronic instruments to take you on a short but sweet musical journey. PS. Each song has a lovely video that has been created by Rainbow Valley to accompany the release: the autumn leaves of 'Spinney' and one for Table Music Meeting's 'Autumn'. You can pay what you like for this digitally, or order the CD and the cute artwork (from A Sparrow By Water, asparrowbywater.com) that comes with it from Wrieuw Recordings' Bandcamp.